Ottawa, ON, September 15, 2016 – According to statistics released today by The Canadian Real Estate Association (CREA), national home sales declined for a fourth consecutive month in August 2016. National home sales fell 3.1% from July to August. Actual (not seasonally adjusted) activity came in 10.2% above August 2015. The number of newly listed homes declined 2.7% from July to August. The MLS® Home Price Index (HPI) rose 14.7% year-over-year in August. The national average sale price climbed 5.4% in August from one year ago. The number of homes trading hands via Canadian MLS® Systems fell by 3.1 percent month-over-month in August 2016 – the largest monthly decline since December 2014. Together with declines in each of the three previous months, the slowdown in August places national home sales activity 6.9 percent below the record set in April 2016. Sales activity was down from levels in the previous month in close to 60 per cent of all markets in August, led by a steep decline in Greater Vancouver following the introduction of a new property transfer tax on homes purchased by foreign buyers. Activity also dropped significantly in the Fraser Valley. August marked the sixth consecutive monthly decline for home sales in the Lower Mainland, as transactions in Greater Vancouver and the Fraser Valley had already been retreating sharply from their peak reached in February. 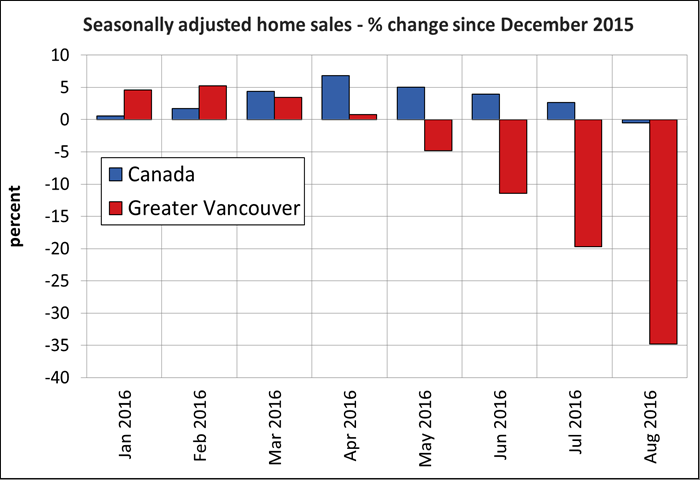 Much of the monthly declines in national sales in recent months reflect slowing activity in the Lower Mainland. Actual (not seasonally adjusted) sales activity was up 10.2 percent year-over-year (y-o-y) in August 2016. Sales were up from year-ago levels in about three-quarters of all Canadian markets, led by Greater Toronto. 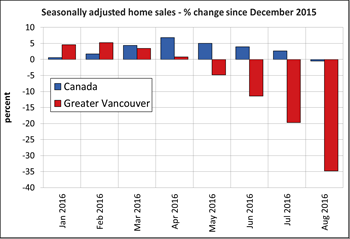 By contrast, Greater Vancouver posted the largest year-over-year sales decline. The number of newly listed homes fell by 2.7 percent in August 2016 compared to July. While new supply was down in just over half of all local markets, declines in the Lower Mainland, Greater Toronto and Montreal far outweighed the monthly rise in new listings in less active markets. With sales and new listings both down by similar magnitudes in August, the national sales-to-new listings ratio was 61.6 percent, which was little changed from 61.8 percent in July. The ratio had previously been as high as 65.3 percent in May. A sales-to-new listings ratio between 40 and 60 percent is generally consistent with balanced housing market conditions, with readings below and above this range indicating buyers’ and sellers’ markets respectively. The ratio was above 60 percent in almost half of all local housing markets in August, virtually all of which continue to be located in British Columbia, in and around the Greater Toronto Area and across Southwestern Ontario. Notably, the ratio moved into the mid-50 percent range in Greater Vancouver in August after having begun the year at 90 percent. There were 4.8 months of inventory on a national basis at the end of August 2016. This was up from 4.6 months in the previous three months and marked the first increase in almost a year. Ingersoll. Indeed, major areas within the GTA have less than one month of inventory. 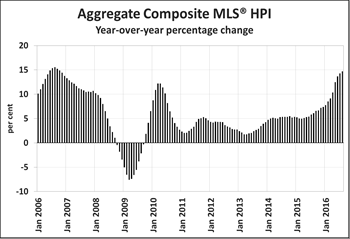 The Aggregate Composite MLS® HPI rose by 14.7 percent y-o-y in August 2016, the biggest gain since October 2006. For the seventh consecutive month, y-o-y price growth accelerated for all Benchmark property types tracked by the index. Two-storey single family home prices posted a 16.3 percent year-over-year increase in August 2016, as did townhouse/row units. One-storey single family homes followed close behind with a y-o-y increase of 14.4 percent, while apartment unit prices rose 11.7 percent y-o-y. While prices in 9 of the 11 markets tracked by the MLS® HPI posted y-o-y gains in August, increases continue to vary widely among housing markets. Greater Vancouver (+31.4 percent) and the Fraser Valley (+38.3 percent) posted the largest y-o-y gains by a wide margin. Smaller double-digit y-o-y percentage price gains were also recorded by Greater Toronto (+17.2 percent), Victoria (+18.9 percent) and Vancouver Island (+13.1 percent). By contrast, prices were down -4.1 percent y-o-y in Calgary in August. Although prices there have held steady since May 2016, they have remained down from year-ago levels since September 2015 and are 4.7 percent below the peak reached in January 2015. Additionally, prices were down by -0.9 percent y-o-y in Saskatoon in August. While prices have remained below year-ago levels since August 2015, they are on track to begin rebounding before year-end should current trends persist. Meanwhile, home prices posted additional y-o-y gains in Greater Moncton (+6.6 percent), Regina (+3.7 percent), Greater Montreal (+2.5 percent) and Ottawa (+1.7 percent). The MLS® Home Price Index (MLS® HPI) provides the best way of gauging price trends because average price trends are prone to being distorted by changes in the mix of sales activity from one month to the next. The actual (not seasonally adjusted) national average price for homes sold in August 2016 was $456,722, up 5.4 percent y-o-y, making it the smallest increase since January 2015. Greater Vancouver’s share of national sales activity has diminished, causing it to have less upward influence on the national average price. Nonetheless, if Greater Vancouver and Greater Toronto are excluded from calculations, the average price is reduced by about $100,000 to $357,033. The Canadian Real Estate Association (CREA) is one of Canada’s largest single-industry trade associations, representing more than 115,000 REALTORS® working through some 90 real estate Boards and Associations. Further information can be found at http://www.crea.ca/statistics.